The Food and Drug Administration has taken its hardest swing yet against teen vaping—though not as hard as we were expecting. On Thursday, FDA chief Scott Gottlieb unveiled a series of steps aimed at forcing the e-cigarette industry to work harder at keeping its products out of the hands of minors. Chief among them is a proposed policy that would mandate that the majority of flavored products only be sold in age-restricted stores or closed-off areas. The actions, however, fall short of a wholesale retail ban on most flavored vaping products that the agency was allegedly planning to pursue, according to a report last week in the Washington Post. And they come in a wake of a new government study showing that teen vaping rates have dramatically climbed this year. According to Gottlieb, the agency will overhaul part of its compliance policy for e-cigarette products. Currently, vaping companies have until 2022 to submit premarket applications to the FDA for their products; these applications, if approved, allow the company to market and sell its products legally. Until then, there’s effectively a grace period during which these products can remain on store shelves. But the FDA has decided to change its stance on nearly all types of flavored e-cigarettes (which the agency often refers to as electronic nicotine delivery systems, or ENDS). Under the policy revision, e-cigarette products with any other flavor besides mint, menthol, and tobacco can’t be sold in stores that don’t restrict their availability to minors (depending on the state, that could be age 18 or 21). Stores themselves can be age-restricted, such as vape and head shops, or stores can close off an area of the store, like behind the counter, to keep the products from teens and kids. A similar restriction would apply to products sold online, meaning websites would need to confirm their customers are over the legal age limit before a purchase is made. The policy change will take time to fully implement, but Gottlieb hopes that retailers and vaping companies will pick up the pace themselves. “We hope that within the next 90 days, manufacturers will choose to remove flavored ENDS products from stores where kids can access them and from online sites that do not have sufficiently robust age-verification procedures,” he said. These restrictions, dramatic as they seem, aren’t what the FDA was rumored to be mulling. Gottlieb was quoted recently as contemplating a full ban on flavored e-cigarettes, while the Washington Post report all but confirmed the agency had drawn up a plan for some kind of ban. And earlier this week, perhaps in anticipation of the FDA’s plan, the vaping giant Juul Labs announced it would effectively stop selling its non-mint and menthol flavored products in stores. Gottlieb alluded to the agency’s relatively lenient approach in his announcement, though he also left the door open to further measures if rates of teen vaping stay high. The agency declined to pursue any action against menthol and mint flavored e-cigarettes, even though these flavors are also popular with kids, arguing that leaving these flavors alone would discourage teens from switching to traditional tobacco cigarettes that are allowed to have these flavors (other, sweeter flavors have been banned in these smokeable products since 2009, as part of the Tobacco Control Act passed under the Obama administration). But that might not be the case forever. The Wall Street Journal recently reported that the FDA is planning to push through a federal rule that would ban menthol in cigarettes altogether, though it’s likely the tobacco industry would fiercely oppose and try to delay its implementation. Also on the chopping block: flavored cigars. Also on Thursday, the FDA, in conjunction with the Centers for Disease Control and Prevention, revealed the latest government figures on teen vaping. According to the findings, collected from an annual, nationally representative survey of teens’ tobacco habits, more than 3.6 million middle and high school students have used e-cigarettes in 2018. That’s nearly double the amount of teen vapers estimated in 2017, and a reversal of what had appeared to be a decline in underage vaping. Not only that, but kids in 2018 also seem to be vaping more often and using flavored e-cigarettes more. 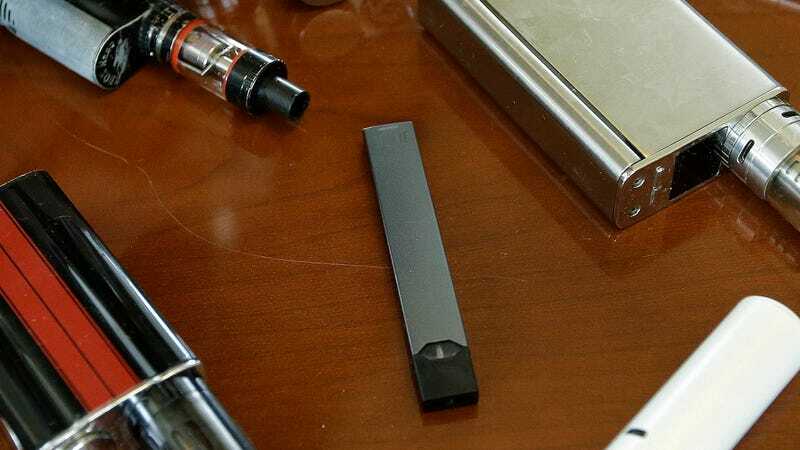 The authors of the report blamed much of the rise on the popularity of newer e-cigarette products developed by Juul and its imitators. These vaping devices, equipped with disposable cartridges also known as pods, are shaped like discreet USB flash drives, come in a variety of fruity and other sweet flavors, and carry more nicotine per puff than other vaping models.